The disruption of yesterday’s annual Remembrance Day service in Omagh has been branded “sickening” by the PSNI chief constable. George Hamilton said the viable device near the cenotaph which prompted a security alert was “small but potentially dangerous”. He said it was “left to cause the maximum amount of disruption” to Remembrance commemorations in the town where 29 people were killed by a Real IRA bomb in 1998. Mr Hamilton said a strong line of enquiry is that violent dissident republicans are responsible. Secretary of State James Brokenshire who was in Enniskillen yesterday described the attack as “despicable”. The PSNI chief constable also described those responsible as “sickening”. He said: “Their actions today have demonstrated the disregard and disrespect they have for this community, which has already suffered so much pain and hurt at the hands of terrorists. One of Mr Hamilton’s officers said those behind the device were cowards. Chief Inspector Graham Dodds described the alert as “a sickening attempt by cowards to create fear and disruption on a day when many gather to pay their respects to the brave men and women who paid the ultimate sacrifice”. West Tyrone MLA Tom Buchanan, who attended the service, said: “Remembrance Sunday is a day when we pause to commemorate all those from every background who paid the supreme sacrifice. It is disgusting that anyone would target a war memorial at any time, but on Remembrance Sunday it is an act of particular hatred. “Omagh has a long association of service within our Armed Forces and those who served came from all backgrounds and traditions. “The cowardice of those who left this device stands in stark contrast to the bravery of those who are commemorated today. Alliance West Tyrone representative Stephen Donnelly hit out at those behind the security alert. 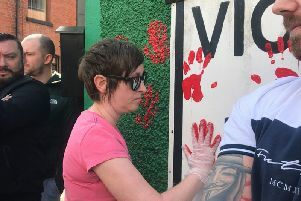 “Those behind this have no regard for the lives of others in the community – people are sick of this sort of behaviour and have voiced their opposition to it in the past. There can be absolutely no justification for it and I would appeal for it to stop,” he said. Sinn Fein MLA Catherine Kelly also condemned the security alert which later was revealed as a viable device. SDLP MLA Daniel McCrossan said: “We must all unite in our condemnation.